The wiring is intact, and I did do a resistance test for the three wires coming off of the distributor before removing it from the car. Each seemed to be OK.
A 'labscope'; is that like the 'banc d'allumeur souriau' that was mentioned by Kay in a previous posting above? I'm living in southwestern France (which explains the French spelling for what I believe is a 'Distributor tester'). I've been searching the internet for antique/vintage car clubs in the Toulouse area, where I live, but have yet to turn up anyone capable of testing my 30-yr-old Bosch distributor. I have found and removed the clip from above the trigger star wheel. A site recommended by Kay ( https://www.nomaallim.com/distributor-rebuild.html ) talks about a second clip under the wheel. I have been unable to locate it, to, as explained in that linked article, 'push it down' before removing the wheel. I've tried prying up with screwdrivers, but that hasn't worked for me. Thanks for your interest in my problem and struggle. This thread needs more Clean Flame Trap! For testing Hall effect sensor. This one is "impulse" sensor, I believe. I forget how it works i would have to look it up. I know I could test it by measuring the output signal with an oscilloscope. It graphs the electrical waveform. A meter could also be used, but I like the visual. Thanks for your message, ZVOLV. That sounds like something that I could use. Ok so I have re-read the thread. I have concluded you have a hall effect sensor. Three wires. Power, ground, signal. Make sure you have power- you do. Make sure you have a good ground on the ground wire! Then finally, measure the signal out. I like to use a scope. Meters can also be used. At a bare minimum, make sure there is less than 2 ohms between the signal wire end-to-end. I think you are on the right track. Its very possibly the sensor is bad based on your tests, but it's possible you didn't do it correctly. Here is a hall effect sensor article I googled. Last edited by ZVOLV; 11-28-2018 at 04:13 PM.. Yes, a Hall sensor distributor. Terminology is variable, but I associate "impulse" sensor with the reluctor and coil of the breakerless ignition, or even that of EZ116K with its crank sensor. This is TZ-28 I believe, and uses the Hall sensor. I've been staying out of the thread because I thought Dave had given the correct advice as I understand it. How the distributor was determined to need a new Hall sensor, I didn't follow, but often that's not so important. Changing the part is an easier task usually, but in this case I'd want to be damned sure because I'd probably bend up the trigger wheel (vane) if I tried this. Apparently Dave, I mean dl242gt, has done it and that's what we need. The voice of experience. Last edited by cleanflametrap; 11-28-2018 at 06:04 PM.. Thanks for clarifying what I rwas referring to Art! I have only done this on the magnetic trigger for the older breakerless system we got on Kjet cars. But I knew the hall sensor setup in a Bosch distributor would be similar. You pry that trigger vane up and off and you have access to replace the hall sensor. Last edited by dl242gt; 11-28-2018 at 06:41 PM.. Reason: change words. I think you are on the right track. It's very possibly the sensor is bad based on your tests, but it's possible you didn't do it correctly. Thanks for having taken the time to re-read this sad-tale of a thread. 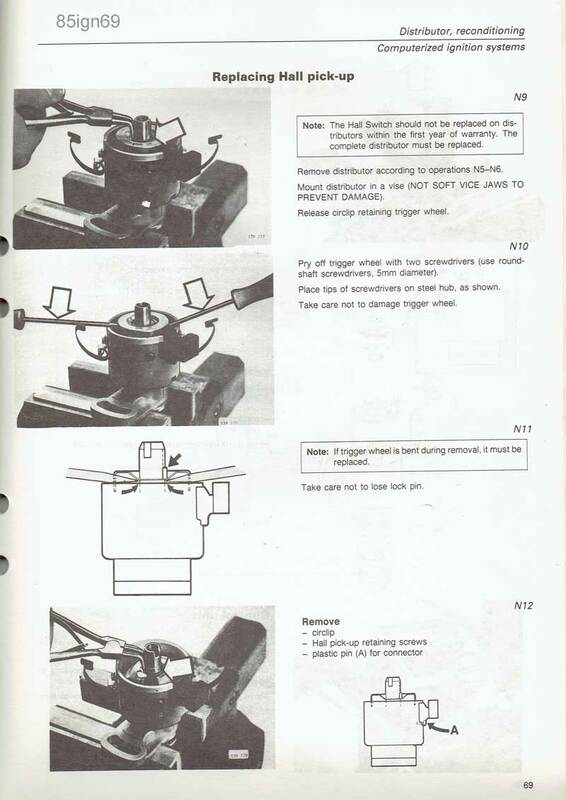 I also appreciate the clear illustration posted by 'Clean Flame Trap' on removing the trigger wheel with a pair of 5mm round-shaft screwdrivers. I think that I'll try that before investing in the AutoWave waveform viewer that was also suggested (although I do believe that one can always use another tool, I've already exceeded my tool budget for 2018 :-). That's just a handheld scope. It eliminates the need for a laptop/desktop. A meter can be used on the Hertz frequency setting to measure the output of a hall effect or crank sensor too. I just prefer the pretty image. On modern cars I just use the scan tool data. I'm invested $1,500 on personal scan tool equipment already for the stuff I do at the shop. Clean flame trap: where is that picture of your homebrew hall effect sensor tester you made!? That may not be needed for the OP, but I'm curious. OP. I would maybe go find a used dist and then test it with a meter set on Hertz AC setting. And do the same with your suspect one. It's a quick and coarse means to evaluate DC voltage and wave pattern, including CAN BUS signals. Clean flame trap: where is that picture of your homebrew hall effect sensor tester you made!? If you make one for the European market, I'll get my deposit ready to get on the waiting list. You have my pics better indexed than I do. Thanks. Cleanflametrap, thank you. Very good and simple idea. I will copy this if you won't mind. 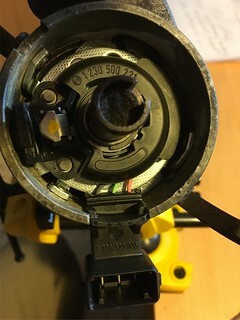 Thanks to an illustration ("Replacing Hall pick-up") posted by Cleanflametrap, I was finally able to remove the trigger wheel from my distributor (the secret was having two, 5mm-diameter, round-shaft screwdrivers to pry with) and install my new sensor (see a photo of it in place). Unfortunately, my prying buggered the lower of the two 14mm inner-diameter snap rings (see photo). I've had to order a replacement snap-ring from China or Singapore, or somewhere in Asia, and I'm hoping to have it for Christmas so that I can (excuse the pun) wrap up this repair job that began in early July. The new sensor (YAY!!!!) came already installed on a new base, eliminating me to have to play blacksmith, drilling out the attaching rivets and then beating in new rivets. 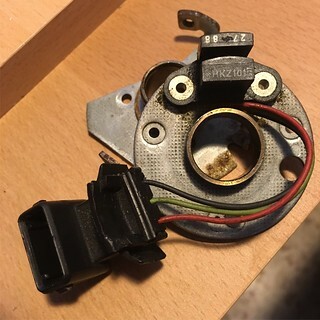 There's no apparent damage to the old sensor, but I did clean out a lot of gunk from the inside of distributor, and the screws that hold in place the sensor were rusted in place (success was mine, however, thanks to WD40). I attribute that gunk and rust to the burst upper radiator pipe that I suspect poured water into the distributor, but maybe it's just an accumulation of 31 years of sitting outside. Whether or not this old, gray lady starts when everything is back in place will likely tell me if my hypothesis was correct. I'll keep the forum updated. PS: I nearly had a heart attack when I thought that I had lost the tiny rod that holds the trigger wheel in place on the distributor shaft. I swept every inch of my office/newly designated workshop floor, twice... This effort included moving a piano, desk and a 95-pound labrador. However, I finally determined that the rod, which had squirted out of the small, plastic tweezers that I had confiscated from one of my son's bug-collecting kits like an errant, miniature missile, had lodged in the vice that was holding the distributor while I worked on it. 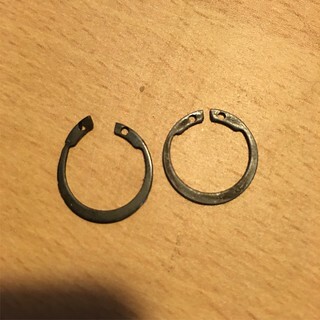 Last edited by Volvo owner in France; 12-10-2018 at 12:22 PM..
Rotor Clip vous offre une gamme complète d’anneaux d’arrêts (circlips, bagues de retenue), d’anneaux en spirale, de ressorts ondulés, colliers de serrage auto compensateurs conçus pour répondre aux besoins spécifiques croissants des secteurs de l’automobile, l’aérospatiale, l’électronique et du secteur industriel en général. Old sensor "looks good"....I don't see any rotted wiring. I'm gonna guess no spark....good luck. One can use a meter set to AC Hertz frequency and measure the sensor output signal. Last edited by ZVOLV; 12-10-2018 at 11:28 PM.. Thanks! This is a great website. I'll keep it in mind for the future. I'm not sure my digital multimeter can measure Hertz frequency. It appears that I can use it just to test for the following: DIRECT VOLTAGE, DIRECT CURRENT, ALTERNATING VOLTAGE, DIODEs & CONTINUITY, AND ELECTRICAL RESISTANCE. But thank you for the suggestion. The French say that you have until the end of January to wish people a Happy New Year, so I'll abide by that custom to wish all of the followers of this thread a healthy, prosperous, breakdown-free 2019. Some of you undoubtedly thought that I got my 240 running again and just neglected to post that bit of information. Unfortunately, that's not the case, even though I managed to install the new Hall sensor in my distributor just before the new year began. Sadly, it didn't make any difference, and the old grey lady is still a fixture of our back yard where she's sat since last July. I hope to evict the spiders that have been busy spinning webs on her during the past six months and, as soon as the temperatures rise above freezing, begin again to try and diagnose the problem. I've purchased, as several of you suggested, a multimeter with a frequency mode, and I'll first verify that the new sensor is putting out the proper sensor output signal. I'll then go through the necessary fuel, spark, ignition tests. With any luck she'll be running again before long. I promise to let you know when that happens. Do you have power to the hall sensor? Thank you for the well wishes. A Happy New Year to you as well. It sure seems like you are very close to figuring this out. Have a good weekend.